Hat Head? What a silly name for a place! But if ever you needed a short break away from the hectic everyday of city life and just wanted to sit on a beach for a couple of days and let the world pass you by then perhaps you should visit Hat Head. The village of Hat Head is 32 kilometres (20 miles) north east of Kempsey, on the New South Wales mid-north coast, and is right in the middle of Hat Head National Park. We took a few days off for a short break at Hat Head during the April school break and with young son, Sean, set out to explore one of our less well-known vacation spots. The Hat Head Holiday Park ([star][star][star]) is just a few steps from the beach and is surrounded by the unspoilt wonder of the national park. 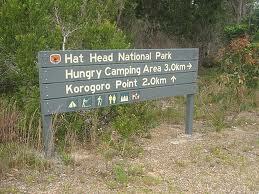 Its tent campsites are all grassed and are big and roomy, and the amenities are modern and clean. There’s so much to do here with fishing and surfing being very popular, especially the fishing, as far as John was concerned. The continental shelf is just 11 nautical miles off shore and more than once he mentioned that we should have brought the boat! The national park has plenty of walking trails, some longer and more strenuous than others but the view from the lookouts makes the walk more than worthwhile. Spectacular is an understatement! 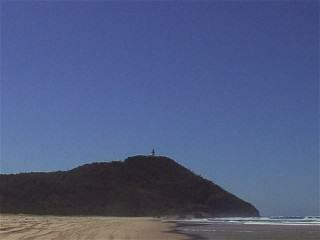 And what a great vantage point for whale watching or seeing dolphins at play. We arrived late on a Monday afternoon and by the time our tents were up, the sun was starting to go down. But that didn’t stop us from going for a walk on the beach. The waves were softly lapping at the shore and the water was, surprisingly, warm. Sean wanted to go for a swim but being in the surf at dusk probably isn’t a good idea. You never know when a hungry shark might be looking for a quick dinner and so, with Sean not doing a terribly good job of hiding his disappointment, we wandered back to camp. Tuesday dawned with one of those glorious sunrises you see so often in magazines or on television; the cloudless blue sky, the sun coming up over calm water, and not even a hint of a breeze. So it was down to the beach for some fishing on this perfect of mornings, driving along the sand until we found a good place to stop. 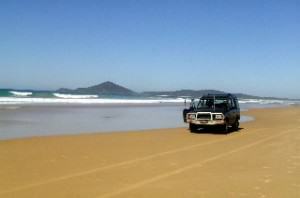 Smoky Cape Beach stretches from Hat Head to Smoky Cape, about 15 kilometres (9 miles), and a beach-driving permit is required; permits can be purchased from the caravan park. The boys threw their lines in and I set off for a walk along the beach. By the time I came back Sean was in for a swim but John was persevering with the fishing, without much luck I might add. Not that that mattered to him; we’ve often said that the art of fishing has nothing whatsoever to do with catching fish! Even so, eventually John gave up too and joined Sean in the water. The weather, like the water, was warm. A little too warm, in fact. I could feel myself starting to burn in spite of the shirt and hat that I was wearing, not to mention sunscreen, so I retreated to the car and left the boys to their own devices. But apart from that, for me it was a good day.There’s a lot to be said for doing nothing occasionally. Late in the day it started to get breezy and a little cloud rolled in. What a difference a day makes! 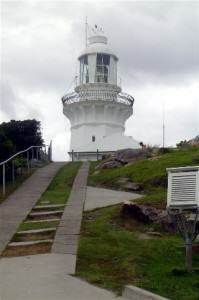 Wednesday morning was very overcast and the breeze of the evening before had become wind as we set off along the beach to Smoky Cape Lighthouse and South West Rocks. The beach this time was in sharp contrast to the day before and there had obviously been some rough seas during the night. There were several washouts of the sand along the way, most of which we avoided but one or two crept up on us and we hit hard. We weren’t worried; the Landrover is made to take that kind of punishment. I just wish my body was! The last ½-kilometre of the beach is closed to vehicles and we left the beach to take the track up to the lighthouse, stopping to have a cup of coffee while we pumped up the tyres. It’s always advisable to deflate the tyres a little before driving on sand but then you have to re-inflate them once you leave the beach. 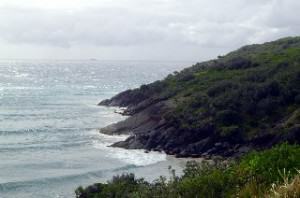 Captain Cook named this headland Smoky Cape. Whilst on his journey down the coast aboard his ship the Endeavour, he’d noticed the smoke from the fires of the local Aboriginal people. Standing 128 metres (420 feet) above the sea, Smoky Cape Lighthouse is the tallest lighthouse in NSW; it’s also one of the oldest. Built in 1891, it is still sending out its warning signal to passing ships today and its light can be seen almost 50 kilometres (30 miles) out to sea. It’s a very steep path to the top but well worth it for the views. Did I say very steep? I walk every day but by the time we reached the top I was almost gasping! Yes, it’s steep but I wouldn’t have missed it for anything. What an outstanding view! The ocean seems to stretch into infinity. It’s a shame there weren’t any boats out there to give some sense of the distance. Leaving the lighthouse we drove through Arakoon State Conservation Area to Trial Bay Gaol. The gaol, on Laggers Point, was built in 1886 and housed the prison labour used to build the seawall between 1886 and 1903. The wall, however, was beset with construction problems and never completed. 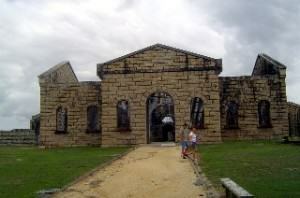 The gaol was then used as an enemy alien internment camp from 1915 to 1918 before being abandoned. On the hill are some graves of internees and a memorial to those who died during internment. Today, the National Parks and Wildlife Service of NSW administers the gaol and its museum. There’s a small entry fee of a couple of dollars and we did ask if we would get our money back if we left Sean behind. They took one look at Sean bouncing about impatiently and said they’d have to double the price! I was fascinated with the gaol; not just the history here but how did they build these big structures in the days before cranes and trucks and things? I suppose the same thing can be said about Egyptian pyramids. It really is quite amazing. We decided on lunch at South West Rocks in a park by the beach and sat for a while watching the snorkellers coming and going. East of Smoky Cape there is a place called Fish Rock and this is reputedly a snorkeller’s paradise. A 100-metre (328-foot) long natural aquarium where you’re likely to see just about every species of exotic sea creature. We took the highway back to camp and made a much too brief stop, at Sherwood Estate Wines; and a very nice drop it is, too. And then it was on to Frederickton and into Kempsey before turning onto South West Rocks Road. The road takes us through the village of Gladstone with its galleries and antique shops; these are always worth a look. You can pick up some really nice pieces here but the weather was being unfriendly with very cool wind and it was just starting to rain and so we thought it best to make our way back to camp. rainbow patterns in the spray. Just trying to catch a photo of it was almost impossible; it was all too fast for our little camera. We didn’t stay out there long as it was getting quite cool. Sean decided to continue on around and over the headland and would meet us back at the other end; he has more energy than we do! But at about the halfway point it started to rain; a brief but heavy shower left us dripping and the wind chilled us to the bone. We met up with Sean at the start of the walking trails and went back to camp for dry clothes, a late lunch, and a very welcome hot cup of coffee. John and Sean dragged out the fishing rods again and I groaned inwardly. 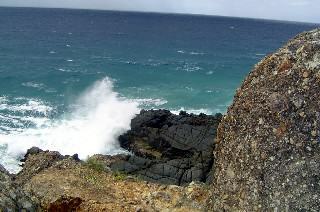 Sitting on a windy beach in the rain was not my idea of fun! At least there were none of the usual promises of a fish dinner tonight; the nearest pizza shop was over 30 kilometres (18 miles) away! Well, I stayed huddled inside our tent with a good book while they set out to see what they could catch but their stay on the sand with fishing rods didn’t last long; the wind was freezing, the water way too rough, and all sensible fish were staying well away. It’s a shame the same couldn’t be said for my boys! They came back drenched to the skin and frozen to the bone. It was only their forlorn looks that prevented me from saying “I told you so”. The wind and the rain picked considerably through the night but cleared sufficiently the next morning so we were able to pack up the camp. Our few days here had been a welcome break and we’d had a great time in spite of the turn in the weather. Hat Head is a great place for a break, short or long, and the summer months can be incredibly crowded but a visit is well worth it and quite literally a breath of fresh air.